I had a couple of days off and I was going to spend them with my father, he lived in pension Clock on the Prinsengracht. The manager was not aware that my father was jewish, and she told me later that she thought that he was an officer in hiding. 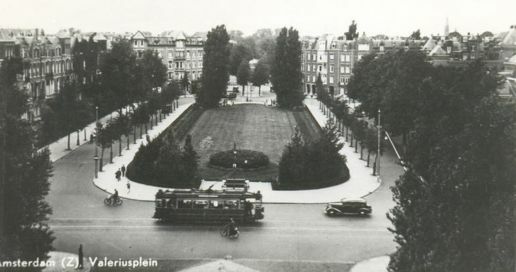 Father worked in the office at the estate agent Steenbergen in the Chassestraat in Amsterdam. Mr Steenbergen was aware of the real situation, as well as Cor, who later with the consent of Mr Steenbergen, hired me to work in the office. Father lived under the alias 'Garrels', and had the identity card of Mr. Garrels, with a changed picture which he had been given by the resistance. Mother and her two sister-in-laws had rented from a Mrs. Grossouw two rooms with the use of kitchen and bathroom in the Cornelis Krusemanstraat No 71. Obviously, they had not informed Mrs. Grossouw of the fact that they were jewish. On the day of the arrest Mrs Grossouw was not present, she was away and heard later what had happened. I went to visit her and she still managed to contact the family who were in the "Hollandsche Schouwburg". After spending a pleasant and confidential day with father, I would pick up mother from the train at the Amsterdam Central Station. Mother had spent a few days with her daughter Wil, who had gone 'underground' at the home of an old schoolfriend in the village of Lemelerveld. Her friend was already married and had two small children. Mother wanted to be there on 18 Augustus, the birthday of her daughter Wil, and had hoped to stay there. There was no question of it. She had been given a large rye bread and apples and was immediately put back on the train, fortunately she arrived safely back at Amsterdam Central Station. She was noticeably disappointed, but glad to see me, we arrived safely by tramline 16 which was practically empty and could talk with each other there. Mother spoke many sweet, confidential words and thanked me for the support and love that she had received from me in these difficult times; she told me that she loved me. She stepped out of the tram and after crossing the road,she walked inside the house. I went back to father. There, I told him that mother had safely arrived. At that time we could not talk much, there was not much to say. We were silent of anxiety and fear, every day that went past was certain, the next day was uncertain. The next day father and I walked to the Cornelis Krusemanstraat to visit mother and the aunts. When entering father immediately asked: "Where is Fietje?" Aunt Mam replied: "To buy fresh bread from the bakery!" I had to restrain myself not say something rude. It was clear that Mother, Aunt Mam and Aunt of Fie were of Jewish origine. How could aunt Fie go outside on the street to buy fresh bread as if there was nothing wrong? Aunt Mam still said: "But the people here do not know her." Later I understood that they did not think about themselves as Jewish. In the meantime Mother was unpacking the rye bread and the apples she had brought. Fortunately father started speaking and I started to stare out of the window still astounded by what had just happened. It was not long after that I saw Aunt Fietje, followed by two men in civilian clothes with a bicycle in hand. ”Dad get out”, I cried out, "she is followed by two". Father had just received an apple from Mother, his fingertips pushed into the apple, a green apple! Where to, where to? Where, where? Go upstairs! Go to the top! Dad hurry up…but then it was too late. Aunt Fie plus the two jewhunters were already at the top of the stairs. Terrible fear… then the interrogation… paper had to be shown. Father had a forged I.D., he lived under the name of the father of a friend of mine from Amersfoort Mr. Garrels. My I.D. also brought problems, so who was I? Yes, J2, who was I? The names were not correct. Father was taken aside by one of the detectives in an adjacent room as soon as it was viewed, literally. Father was a Jew. The mother and aunts had the time, under the watchful eyes of the jew traitors, to gather some belongings to take with them. Father had nothing to pack since he did not live there. Then came the moment that I could no longer cope with the situation, I went into a rage and seized one of those guys by his tie and pulled that tight, his colleague drew his pistol because I refused to let go, Father went to his knees and begged me to let loose , the gun was pressed to the temple of my head, thanks to my Father, I have not committed murder. Then Father sent me to the pharmacy to buy some "Saridon", for the pain in his back. "Will you wait on me until I come back?" I barked at the guys, "but do so quietly." I ran to the pharmacy and yes when I came back they were already in the tram and I could manage to throw the box on the balcony of the tram... ,And then they were gone! Totally dazed, no father, no mother, no aunts. I received all kinds of instructions from the aunt's and my mother and father of course. All the things they had given me were upstairs in the apartment in the Cornelus Krusemanstraat. With the few coins chance I had received from the pharmacy in my bag, I now had to go to the Prinsengracht. So I decided to walk, with tears running down my face. Now I was really alone, I had never been alone like this before. I walked and walked and then I arrived at the adress, now I had to be brave. Then I heard someone say, "be a big girl, it will be allright." Father had said, look under the carpet and look here and there, but yes, someone else had probably known and had been there before. Father had phoned before I arrived and had trusted the person he had called. There was nothing left, nowhere. I laid down on father's bed, the electric cusion for his back was still on and I cried and cried. Sunday, I went to the 'Hollandshe Schouwburg'. There, someone called father, and a few moments later they also allowed mother to come into the hall. Father was very calm, but Mother could only call my name whilst sobbing, so someone pulled her roughly back inside. Father and I stood there all alone, we hid inside a wardrobe and exchanged some insignificant words and then I had to go, "bye Pap"… forever.